GetTaxi, the cab booking service that recently snagged $20 million funding, has launched new websites allowing people in the cities where it operates to book cabs without needing to have a GetTaxi account (or download its app). 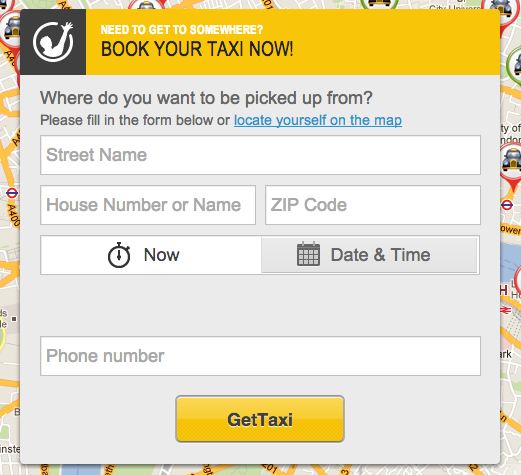 GetTaxi currently operates in London, Moscow and Israel — but plans to use its recent funding round to launch in New York next year. To date, it’s raised $30 million. As well as evolving from largely an info portal to a streamlined booking platform, the websites have been refreshed — with a simplified design aimed at making it quick and easy for customers to make bookings. Another new feature of the websites announced today is the launch of business account management, allowing small- and medium-sized businesses to open an account (by providing credit card details) to manage all their taxi rides, expenses and accounting. The startup is touting this service as a way for SMBs to simplify pricing, invoices and expenses for cab journeys, as well as making it easier to procure a secure ride in the first place.